Add the rice and cook, stirring until well coated with olive oil and beginning to toast. Add the wine and cook, stirring until the wine is absorbed. Add 1 cup of the warm stock and cook over moderate heat, stirring constantly, until nearly absorbed. Continue adding the stock ½ cup at a time, stirring constantly, until it is nearly absorbed between additions. The risotto is done when it is opaque and just the sauce that has formed from the rice, creamy. About 20 minutes total. Add the truffle oil and cheese in at the very end, and adjust the seasoning with salt and pepper. Mix together ½ cup of bread crumbs and the beaten egg with the cooled risotto. Heat 2" of UP Extra Virgin Olive Oil to 350 F. in a heavy pot with relatively high sides. 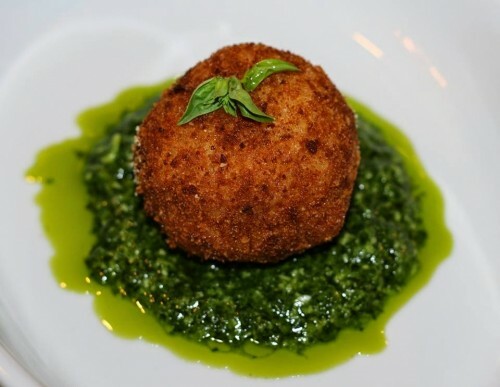 Preheat the oven to 250 F.
Place the breadcrumbs in a shallow dish or plate for rolling the arancini and cut the mozzarella into small ½" cubes.